A. Pulpit legs: 2 pcs B. Pushpit legs: 2 pcs C. Deck legs 0, 9-2, 05 m: 2 pcs C. Deck legs 1, 5-2, 8 m: 4 pcs C. Deck legs 2, 0-3, 3 m: 2 pcs Max width of boat: 4, 2 m Perfect for sailboats with pushpit, pulpit and guard rail Adjustable legs in both directions Frame keeps tarpaulin from the sides for perfect ventilation The price does not include freight. NoTool ECONOMY frame for center console boats, max 6 m.
NoTool Economy is adapted to 6 m boats Unique NoTool couplings in aluminum and stainless steel that fits Scandinavian conditions Strong construction in 35mm and 30mm anodized aluminum Included straps ensure construction and increases stability Two pairs of leg pair supports the ridge and is attached to the railing Lintels pipes 2 m: 1 psc Lintels pipes 2 m (with end cap): 2 psc Quantity of leg pairs: 2 Economy legs L: 1, 5 m: 4 psc Straps 5 m: 4 psc The price does not include freight. Frame: Powder coated steel tubing for protection against corrosion Tube diameter: 28mm Width: 2.43 m. Length: 0.76 m. Side height: 0.75 m. Folds completely for easy storage Powder coated steel tubes, 1 mm Tubes: Ø 28 mm Table top made of High-Density Polythylene Dimensions (folded): 122 x 76 x 10 cm (L x W x H) The price does not include freight. Wireless submersible LED lights, including batteries. Waterproof and re-usable, For indoor and outdoor use, pink Product info: Width: 0.03 m. Length: 0.03 m. These fun LED lights are perfect for lighting up anything you can imagine! Use them as you would tealight candles or votive candles, in floral arrangement or table settings. Product info: Width: 1.93 m. Length: 2.57 m. Side height: 1.24 m. Ridge height: 1.95 m. Sidewalls: 4 mm Polycarbonate Frame: Aluminium The price does not include freight. Please contact our customer service. Dancover Ireland Our professional sales advisors are at your service. 25m LED Light Rope with 36 lights per meter. For indoor and outdoor use. Remember adapter! Product info: Length: 25 m. Colour: Cold White Plug directly into power outlet 230 volts Transparent PVC tube with 36 LEDs per meter Description Add to your party an extra touch with this attractive, light rope. Weight: 70 kg. 2 pieces of folding benches 242 x 28 x 43 cm 1 pieces lightweight banquet tables 242 x 76 x 74 cm Banquet tables Folds for easy storage Powder coated steel tubes Table top made of High-Density Polythylene Colour: White / grey Dimensions (open): 242 x 76 x 74 cm (L x W x H) Weight: 30 kg/pcs. Folds completely flat for easy storage Seat height: 45 cm Dimensions (open): 44 x 43 x 80 cm (W x D x H) Description Elegant light weight folding chairs made of strong steel tubes folding completely for easy storage. Ideal for garden parties, events, commercial use or hire. The price does not include freight. Product info: Width: 0.43 m. Length: 0.44 m. Side height: 0.8 m. Frame: Powder coated steel tubing for protection against corrosion Persons: Testet to 190 kg The price does not include freight. Please contact our customer service. Dancover Ireland Our professional sales advisors are at your service. Material: PE250g Width: 6 m. Length: 8 m. Weight: 20 kg. The price does not include freight. Please contact our customer service. Dancover Ireland Our professional sales advisors are at your service. Call us on 151 33 003 www.dancovershop.com. Frame: Powder coated steel tubing for protection against corrosion 4 pieces of folding chairs 44 x 43 x 80 cm 1 pieces lightweight banquet tables 152 x 76 x 74 cm Banquet tables Folds for easy storage Powder coated steel tubes Table top made of High-Density Polythylene Colour: Grey / white Dimensions (open): 152 x 76 x 74 cm (L x W x H) Weight: 18 kg/pcs. Material: Strong polyethylene tarpaulin 200 gr./m² Width: 5 m. Length: 8 m. Weight: 3 kg. Colour: Transparent (White net reenforcement) Ripstop Eyelets The price does not include freight. Please contact our customer service. Dancover Ireland Our professional sales advisors are at your service. Material: 100% Polyester Width: 2 m. Length: 16 m. Weight: 16 kg. Description Beautiful and practical carpet for marquee. Give your marquee a stylish and comfortable base while minimizing dirt, moisture and drafts. The carpet is easy to install. Best on firm surface. The price does not include freight. Material: Strong PVC 500 gr/m² Width: 2.6 m. Length: 6.2 m. Weight: 8 kg. Heavy duty ground cover in PVC Low-priced cover solution Comes with eyelets at the ends Moisture barrierer The price does not include freight. Please contact our customer service. Material: PE150g Width: 1.76 m. Length: 3.41 m. Weight: 20 kg. Description Building fence tarpaulin is especially developed for the attachment to mobile fences for visual protection during happenings. The tarpaulin, which fits exactly to the size of the fence, is easily attached thanks to the eyelets. Material: PE250g Width: 6 m. Length: 10 m. Weight: 20 kg. High quality PE cover solution Good quality Ripstop Eyelets Description Low priced tarpaulin made of Polyethylene (PE) with built-in ripstop. 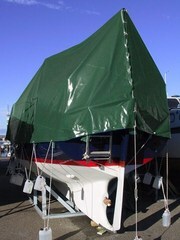 The tarpaulin is delivered with eyelets in the edging. The. Material: Strong PVC 570 gr./m² Width: 6 m. Length: 10 m. Weight: 40 kg. Tarpaulin PVC heavy duty Tensile strenght 1800N/5cm Tear resistance 280N Temperature resistance -30 / 70 celsius Brass Eyelets Ø18mm, for each 1 m Tear resistance eyelets 950N Ripstop The price does not include freight. 60 pieces of folding chairs 10 pieces lightweight folding Table 183 x 76 x 74 cm 72 m² plastic floor Banquet tables Folds for easy storage Powder coated steel tubes Table top made of High-Density Polythylene Colour: white/grey Dimensions (open): 183 x 76 x 74 cm (L x W x H) Weight: 16, 5 kg/pcs. Roof cover: Strong PVC 600 gr./m², BS 5438:1989 2B Certificate, 100% Waterproof Sidewalls: Strong PVC 600 gr./m², BS 5438:1989 2B Certificate, 100% Waterproof Frame: Hot-dip galvanized Tube diameter: 60mm Width: 9.15 m. Length: 12 m. Side height: 2 m. Ridge height: 4.5 m. Included: Stake pegs 0, 70 m Weight: 1000 kg. Material: 100% Recycled PE Width: 0.5 m. Length: 0.5 m. Side height: 0.05 m. Weight: 5 kg. 100% recycled Pe and 100% recyclable UV-resistant Max load 90 t/m² Stands almost any amount of cold or heat Does not need maintenance The price does not include freight. Material: 100% Recycled PE Width: 0.5 m. Length: 0.5 m. Side height: 0.05 m. Weight: 45 kg. 100% recycled Pe and 100% recyclable UV-resistant Max load 90 t/m² Stands almost any amount of cold or heat Does not need maintenance Approach ramps are optional extras The price does not include freight. Material: Polyethylene 65 gr./m² Width: 3 m. Length: 5 m. Weight: 1 kg. Low-priced cover solution Ripstop Eyelets The price does not include freight. Please contact our customer service. Dancover Ireland Our professional sales advisors are at your service. Call us on 151 33 003 www. Frame: Powder coated steel tubing for protection against corrosion Tube diameter: 28mm Width: 2.43 m. Length: 0.76 m. Side height: 0.75 m. Weight: 30 kg. Folds completely for easy storage Powder coated steel tubes, 1 mm Tubes: Ø 28 mm Table top made of High-Density Polythylene Dimensions (folded): 122 x 76 x 10 cm (L x W x H) The price does not include freight. Frame: Powder coated steel tubing for protection against corrosion Tube diameter: 28mm Width: 1.52 m. Length: 0.76 m. Side height: 0.74 m. Weight: 375 kg. Folds completely for easy storage Powder coated steel tubes Table top made of High-Density Polythylene Dimensions (folded): 76 x 76 x 10 cm (L x W x H) The price does not include freight. Product info: Width: 2.7 m. Length: 6.1 m. Side height: 1.95 m. Ridge height: 2 m. Frame: Fiber glass in strong quality Persons: 4 pers. The price does not include freight. Please contact our customer service. Dancover Ireland Our professional sales advisors are at your service. Product info: Width: 1.93 m. Length: 3.19 m. Side height: 1.24 m. Ridge height: 1.95 m. Sidewalls: 4 mm Polycarbonate Frame: Aluminium The price does not include freight. Please contact our customer service. Dancover Ireland Our professional sales advisors are at your service. Product info: Width: 2.9 m. Length: 4.2 m. Side height: 1.95 m. Ridge height: 2 m. Frame: Fiber glass in strong quality Persons: 4 pers. The price does not include freight. Please contact our customer service. Dancover Ireland Our professional sales advisors are at your service. Dublin ads Dublin, All categories classifieds Dublin, All categories free ads Dublin, ads for sale Dublin, ads to buy Dublin, FREEADS in Ireland Dublin Page number 7-1. Find here ads for sale, to buy and rent in Dublin. Goods for sale in Dublin, vehicles for sale in Dublin, Dublin real estate for sale, Dublin property for sale, property for rent in Dublin, business ads in Dublin, Dublin business classifieds, services in Dublin, Dublin services ads, jobs in Dublin, pets for sale in Dublin, Dublin dating, Dublin cars for sale.